Rotterdam The Hague airport (RTM) is the third busiest airport in the Netherlands and is located 6km from Rotterdam city centre and around 60km from central Amsterdam. 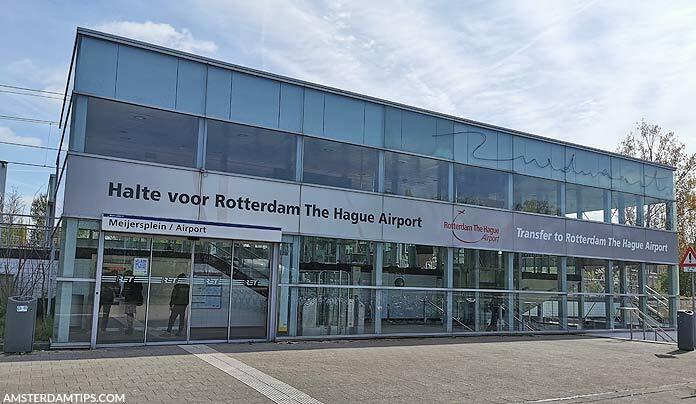 Below we show how to get from Rotterdam airport to Rotterdam centre by public transport and then beyond to Amsterdam and The Hague (Den Haag) or elsewhere in the Netherlands. 1. Local RET bus 33 to Rotterdam Central station (€4 single, up to 6x hourly). 3. Intercity or Intercity Direct train from Rotterdam to Amsterdam Central (€15.40 single, €1 extra for disposable tickets, Intercity Direct supplement €2.40, run regularly all day). 4. Rotterdam airport taxi rates: to Rotterdam station €25; to Den Haag €55; to Amsterdam approximately €150. Let’s take a look at these travel options in more detail with some tips and advice for visitors. The OV-chipkaart (public transport smart card) is in use in the Netherlands which has made public transport a bit more complicated for visitors. For the Rotterdam airport to Amsterdam journey we would advise most visitors to keep it simple and just buy standard single tickets for both the local bus and intercity train. If you do plan to use a lot of public transport however, you may want to purchase a plastic anonymous OV-chipkaart (costs €7.50 and lasts 4-5 years) to which can be added travel credit – travelling using credit (checking-in and -out using the card readers) works out a little bit cheaper than standard singles. The AKO newsagent (open daily 0600-1900, closes 1800 Sun) at Rotterdam airport sells anonymous OV-chip cards with €10 travel credit for €18. Alternatively, come out of the terminal and head left – the airport bus stop is a short walk away. There are a couple of RET automatic ticket machines which sell a variety of tickets – coins, debit and credit cards are accepted. RET city bus 33 serves Rotterdam Airport. It now runs between Rotterdam Central Station and Meijersplein metro station, stopping at the airport either way. Buses to both Rotterdam Central and Meijersplein metro station leave approximately every 10 minutes during the day and every half-hour in the evenings. The service runs from 0600 weekdays, 0630 on Saturday and 0830 Sunday and operates all day until just after midnight. So if heading to the centre make sure to get on the bus to Rotterdam Central – this journey takes 20-25 minutes. A single ticket (“RET 2 hour”) costs €4 and can be purchased from the ticket machine or driver. Children 0-3 travel free. If checking-in and -out using a personal or anonymous OV-chipkaart the single journey is a bit cheaper at around €1.90. The 33 bus arrives at the bus terminus near Rotterdam central station. Take the RET bus 33 which runs frequently from Rotterdam airport to the nearby Meijersplein metro station – this takes 10 minutes. From there you can take the RET metro (E line) which runs between Rotterdam central and Den Haag central. The metro trip to Den Haag takes about 25 minutes, meaning a total travel time from the airport of about 45 minutes. A standard RET 2 hour ticket is €4. Note, other tickets available are the RET 1 day (€8) and a Tourist Day Ticket (€13.50, valid for 1 day’s travel in South Holland province on RET, Arriva, HTM and Waterbus). If you have any queries about public transport you can always ask at the Information Desk at Rotterdam airport terminal. It is open daily from 0830. 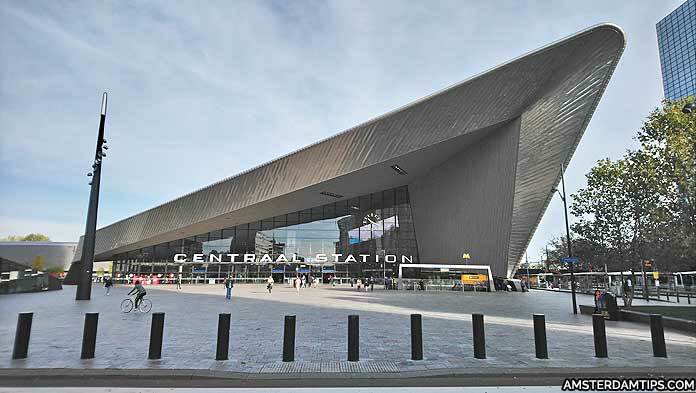 NS trains run frequently between Rotterdam Central and Amsterdam Central stations. There are a number of different services – a fast domestic train called Intercity Direct takes just 40 minutes and runs 4x hourly on a dedicated high speed track to Schiphol and then onto Amsterdam Central. Supplements for the Rotterdam-Schiphol sector are mandatory for travel on this train. Alternatively you can take an Intercity train to Amsterdam Central which travels to Schiedam, Delft, Den Haag HS, Leiden, Haarlem and Amsterdam Sloterdijk. The journey times is just under 1 hour 15 minutes with departures every 15 minutes. There is also a Sprinter stopping train service (direction Uitgeest, 2x hourly) which runs via Gouda and stops at Amsterdam Bijlmer-ArenA, Amsterdam Amstel and Amsterdam Central. Travel time is only a little more than the Intercity. The OV-chip card system is also used on Dutch railways and you will need to check-in and check-out of your journey. The standard one-way fare from Rotterdam to Amsterdam Central costs €16.10 (2nd class) or €26.57 (1st class) – these fares apply when using credit on a personal or anonymous OV-chip card. There is a €1 surcharge for buying a disposable ticket. You will need to have a minimum of €20 credit balance if using an anonymous OV-chip card for train travel. If you bought a card at at Rotterdam airport you will need to add further credit at the station desk or ticket machine – this will also activate the card for use on the rail network. Intercity Direct supplements cost an additional €2.40 (€2.60 from 1 July 2019) each way – buy the supplement before boarding the train as it costs €10 on board. The supplement is available either as a paper ticket or can be paid with an OV-chipkaart. Children 4-11 only pay €2.50 each (no surcharge) for a Railrunner ticket which is valid the whole day on the Dutch rail network including Intercity Direct trains. Children 0-3 travel free. You can buy disposable train tickets, Intercity Direct supplements or anonymous OV-chip cards at the station Tickets & Service desks or at the yellow and blue ticket machines. Both accept debit/credit cards (V-Pay, Maestro, Mastercard, Visa and American Express) using pin and/or contactless. If you want to pay by cash go to the service desks as the machines only accept euro coins. 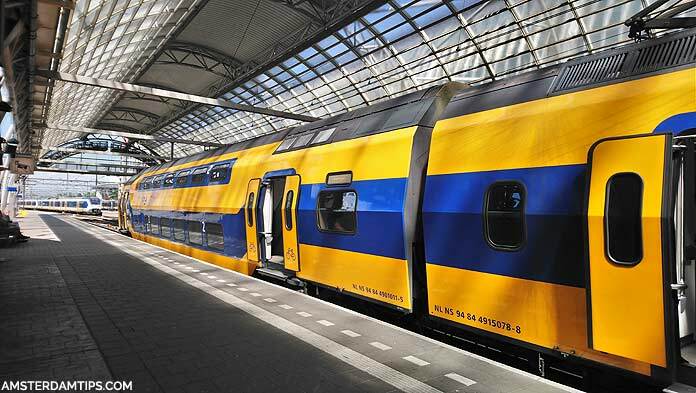 For more rail ticket tips see our guide How to Buy a Dutch Train Ticket. For speed and comfort it is well worth paying the Intercity Direct supplement – especially if you have large suitcases. Intercity Direct trains have decent overhead storage racks. Standard double decker Intercity trains have stairs to navigate and tiny racks – though space for luggage can be found between opposing seats. For night owls, an hourly night train (0100-0500) runs both ways between Rotterdam and Amsterdam. 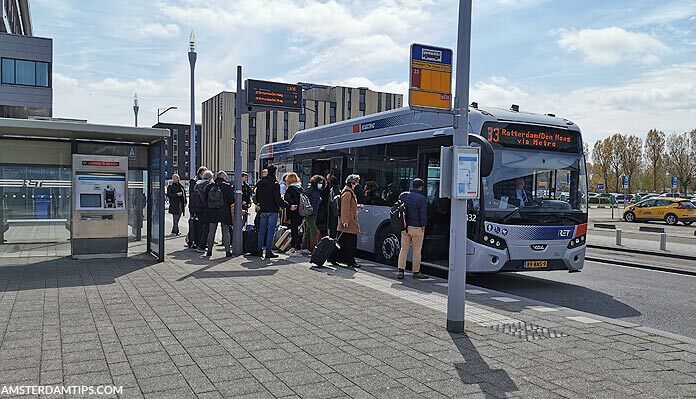 Amsterdam to Rotterdam return trip: Just do the journey in reverse – train from Amsterdam Central to Rotterdam, then walk out to the bus station to get RET bus 33 back to the airport. Detailed rail timetables can be found at ns.nl. Amsterdam Central is the transport hub of Amsterdam – see Getting Around Amsterdam for cost-effective public transport options in the city. If travelling elsewhere in the Netherlands there are direct trains from Rotterdam to Amersfoort, Breda, Dordrecht, Eindhoven, Groningen, Hoek van Holland, Leeuwarden, Leiden, Utrecht, Venlo and Vlissingen. International trains include the Thalys to Antwerp, Brussels and Paris and the Intercity to Antwerp and Brussels. Taxis in Netherlands are not particularly cheap. From Rotterdam airport expect to pay about €20-€25 (central Rotterdam), €35 (Rotterdam Alexander), €55 (The Hague), €100 (Rotterdam Europoort), €125 (Schiphol) and €150 (Amsterdam). The airport also has desks from many major car rental companies. Transport Network Map from Dutch Airports: Take a look at our airport transport connections map to visualise your onward journey from Rotterdam airport around the Netherlands.